Thank you to Establishment for hosting us and sharing complimentary dishes. As always all thoughts and opinions shared are 100% my own. 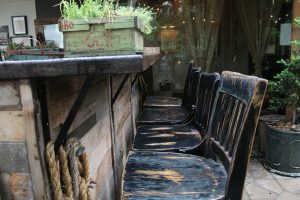 If you love the feel of a rustic restaurant with a buzzing evening bar then you must check out Establishment. When having a girls weekend with some other mommy bloggers we felt this place was a must see. The decor is rustic, patriotic and cozy. Manager and Co Owner David, from Boston (a fellow northerner) has a background in cocktailing and advertising. Have you ever seen booze travelers? Yes, think of that, fun Boston guy who knows a good drink. 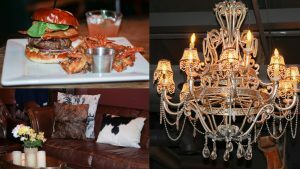 David told us they originally started out with a speakeasy in buckhead in 2014. Since Buckhead was established in 1857 the name followed from that. 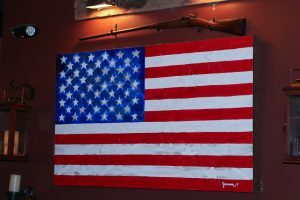 Jansen Robinson a local artist did many of the paintings including this gorgeous 3D flag art. All of the food was insanely good! I don’t think all people can nail brussels sprout, but this restaurant sure did! The fries were hard to pump the breaks on… we devoured them. 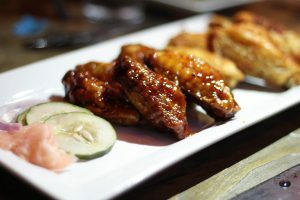 If you like wings the way I do, then you’ll love them at Establishment. I love my wings crispy and let me tell you, these were cooked to perfection! Dietary issues? There are many gluten free options here! When you go, if Natalie is working, ask for her! She’s the most bubbly & fun waitress I’ve had the pleasure of meeting. All the waitstaff was amazing, but she really stands out from the rest! 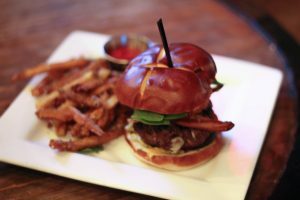 Vote for your favorite Chef creation burger here! Voters can also search “Establishment” to vote for the Southern Bell. Establishment is participating in the “The Blended Burger Project (BBP) for the second year and will have the burger on the menu officially May 29 through July 31, 2017. The five chefs with the most votes for their burgers will be invited to the James Beard House to prepare their burger in January 2018. “The Southern Bell” a Chef Aaron Avers burger creation with portabella mushroom, a fried green tomato, poblano pimento cheese and smoked bacon, on a pretzel bun for $12 at Establishment. 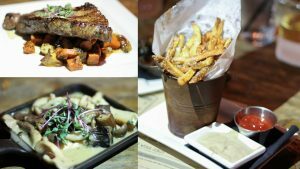 Alright friends, when you are in Atlanta head to Establishment, the food, drinks and atmosphere will wow you. Next Post Casual Overall Fashion with bluish & co. 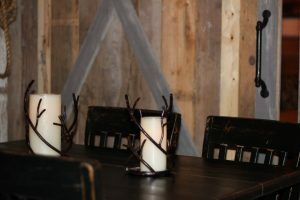 I LOVE the rustic charm in the decor and that food looks amazing! 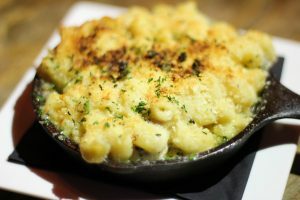 The food at Establishment looks incredible, and I love their decor! I love those chairs at the bar! SO glad to hear they have GF options!